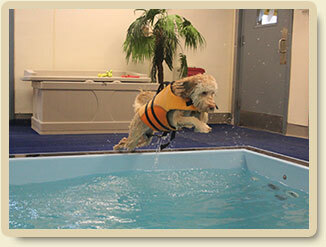 Morris Animal Inn is proud of its Luxury Canine Spa with Indoor Pool! Whether for an exciting interactive session of swimming and playing pool-side, or a relaxing retreat in our tropical oasis, Morris Animal Inn provides your dog with a fun and rejuvenating experience! Great for splashing in the water, playing poolside, and chasing after toys for a fun dip in the pool! Sessions include a post-swim blow dry. Sessions can be scheduled as an activity while boarding, grooming, or attending daycare. Water loving dogs will be happy with our Poolside Daycare! These guests swim and play the day away. They enjoy a wholesome snack and relax in our luxury suites. Please consult your veterinarian prior to beginning any exercise program for your dog. A permission form must be signed by owner prior to a reservation.